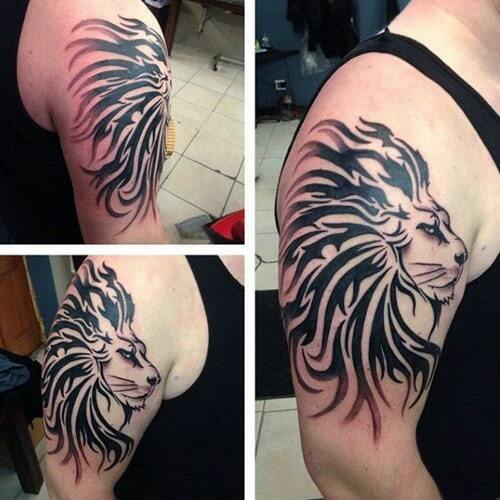 If you are going for a robust and striking yet meaningful tattoo then getting a lion tattoo is your safest bet. For thousands of years, various cultures around the world see Lions similarly due to their ferocity in the wild. 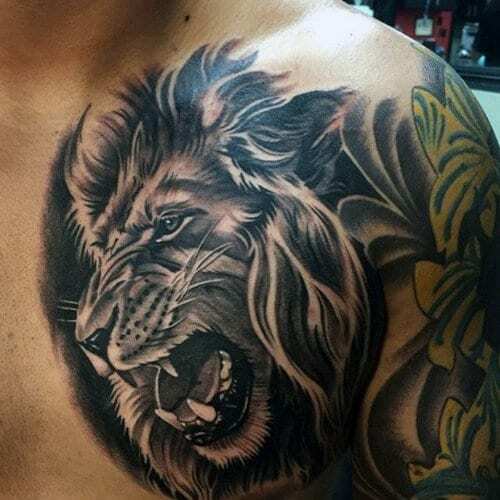 Because of the Lions’ fame, they became an essential and admirable symbol to many which eventually led them to become an excellent tattoo design choice. 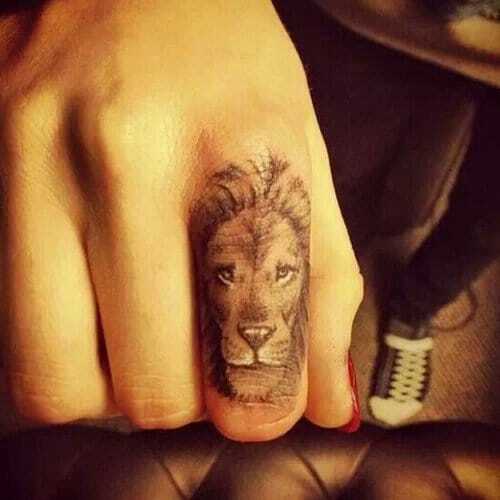 A lion tattoo symbolizes power, courage, loyalty, and authority among other characteristics. 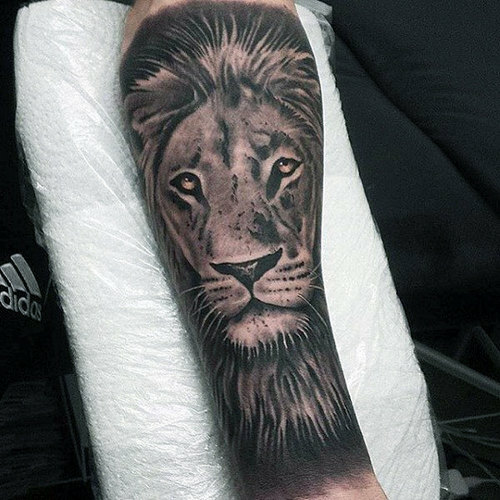 The design, color, and size of a lion tattoo affect its look and feel while its placement can add more meaning to the tattoo. 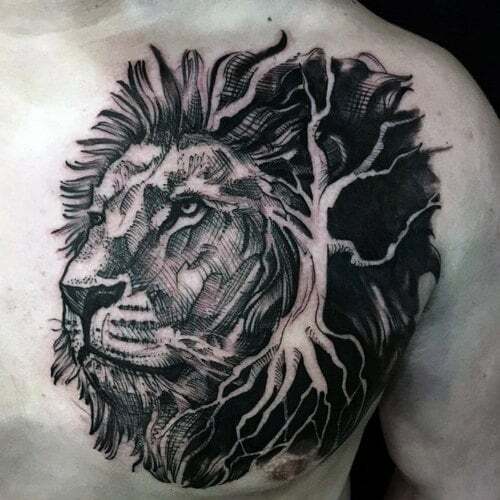 We have gathered the 110+ Fiercest Lion Tattoo Designs with Meaning to help you get more inspiration and ideas for your next tattoo. 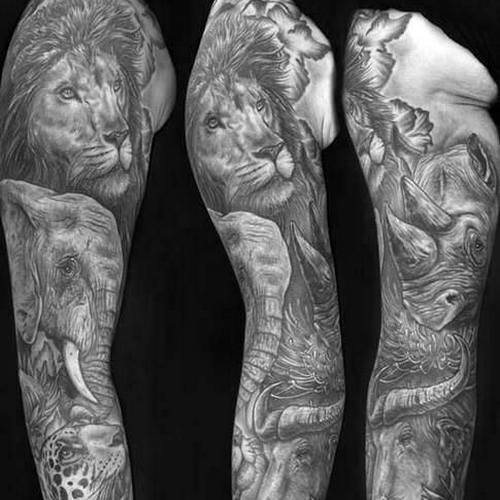 Various cultures see a lion tattoo as a symbolism of a person’s strength, bravery, and power while others see it as a symbol of justice, authority, and protection. 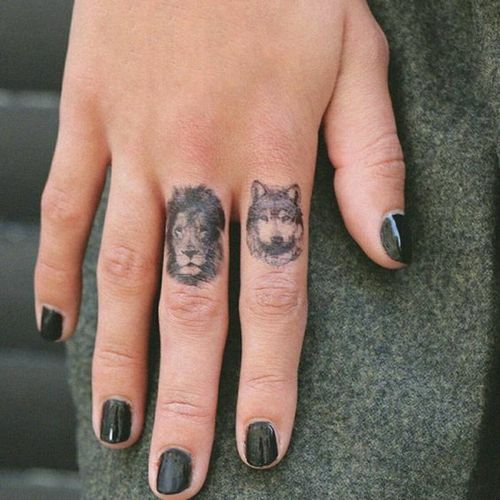 Since it is a tattoo, people can add meaning to it while others can give it other interpretations. We hope that you’ll be able to come up with some inspiration and design after you’ve finished this article. 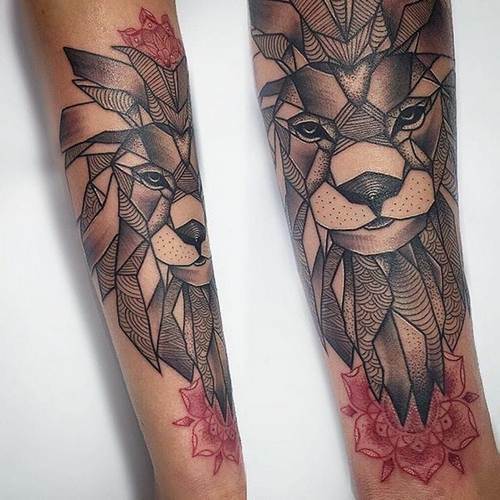 Various cultures use tribal tattoos as a way to display their rank and authority in their society, while in the modern days, a tribal design lion tattoo gives the person who wears it a similar effect because of its ancient look. 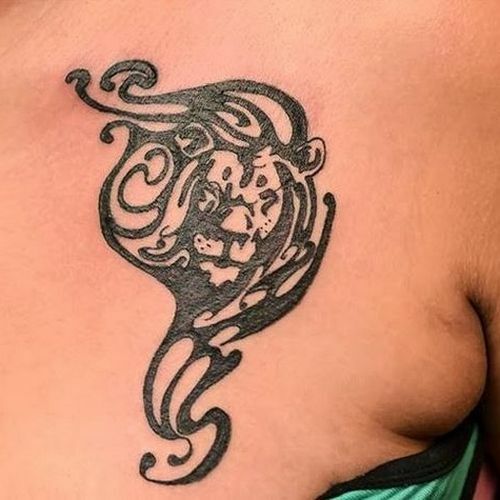 The tribal design of the lion complements its Samoan-inspired outline because of the balance achieved by the soft curvy lines and the linear framework. 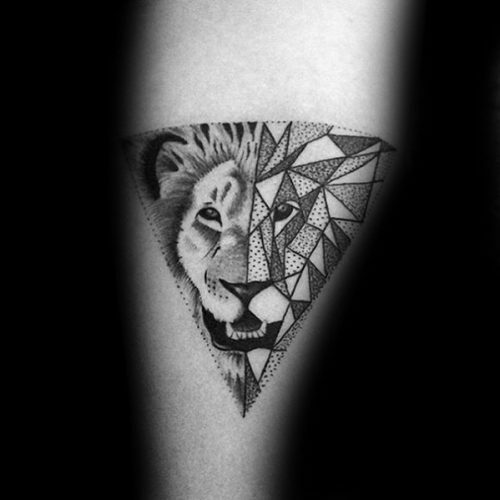 The tribal lion tattoo has an exceptional tribal design where its edges are soft giving it a more feminine look. 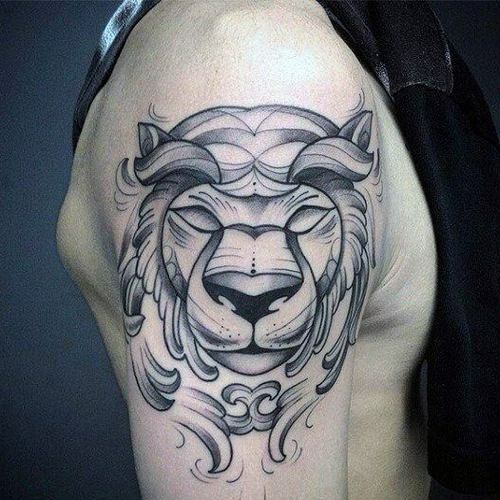 The ferocity of the lion is well inscribed in this tattoo because of its white eyes and contemporary crown design. This tattoo gives a more simplistic look because of its two-dimensional sideways position. Its shoulder positioning gives it an aggressive look since it faces the same direction as its tattooee. 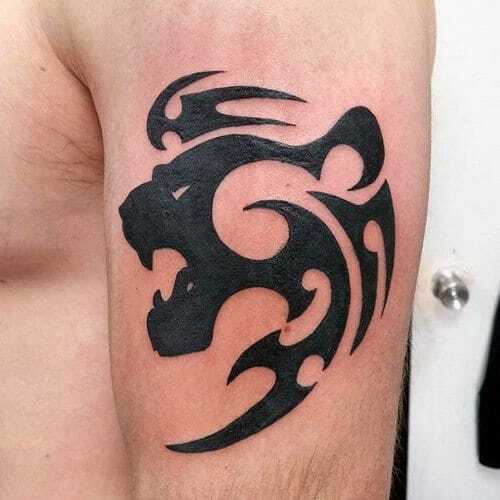 A minimalist yet fierce lion tattoo due to its sharp points and roaring lion. 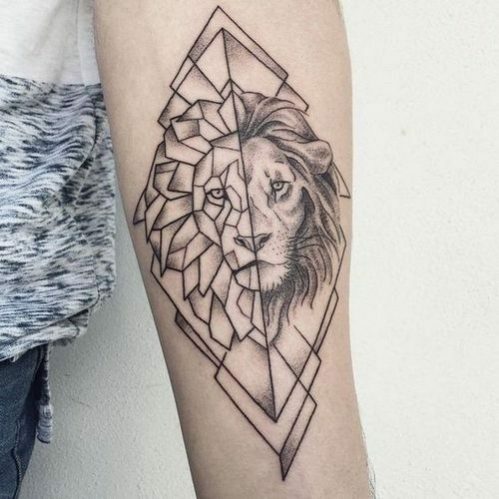 This lion tattoo comes with a unique design of a full-bodied abstract lion, therefore, adding up to its uniqueness. 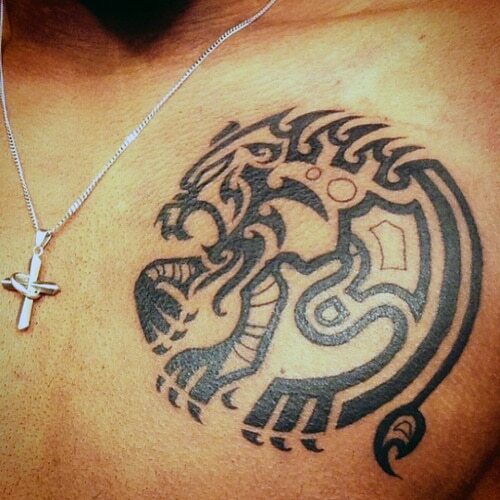 The tattoo looks more like a symbol which certainly adds a puzzling attribute. 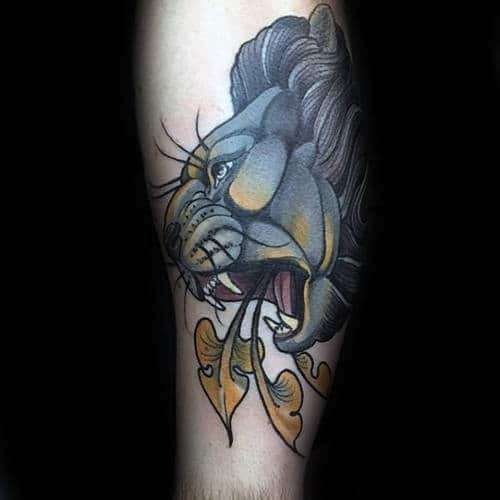 The lion head with the tribal sword design means aggressiveness, strength, and courage. 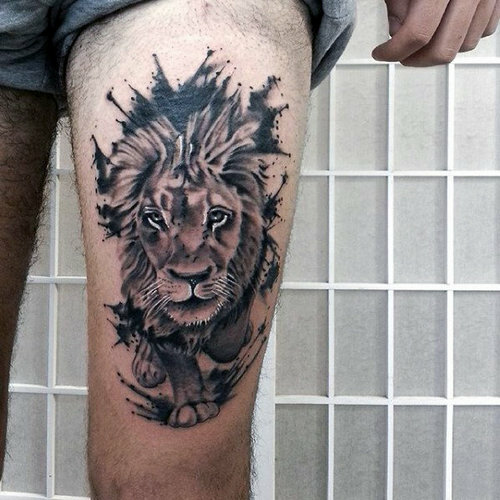 The standing lion tattoo is well-placed at the back of the person which gives more meaning to whichever quote you choose to put beside it. A lion roars to announce its presence to everyone in the wild. 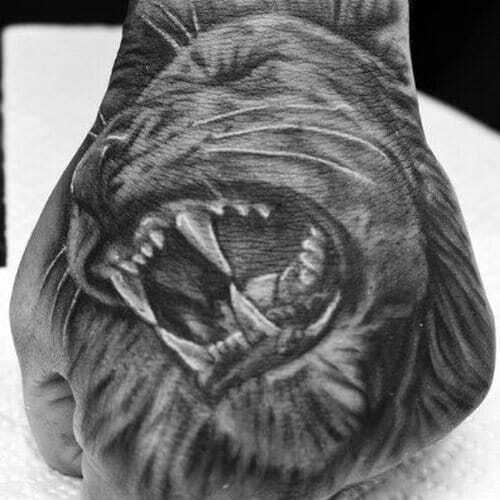 Just looking at this tattoo indeed reminds us of its strength and ferociousness. 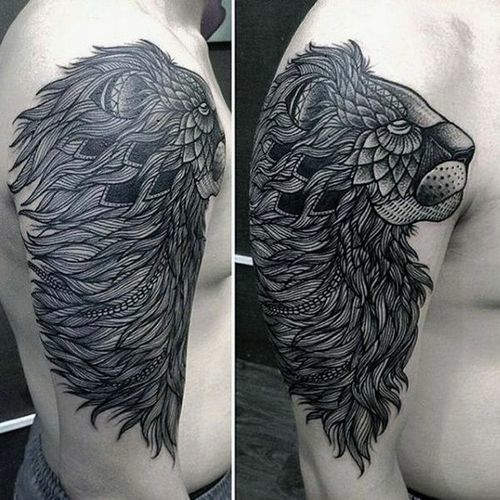 This tattoo has a more subdued design for the reason that it is drawn with more wavy lines. 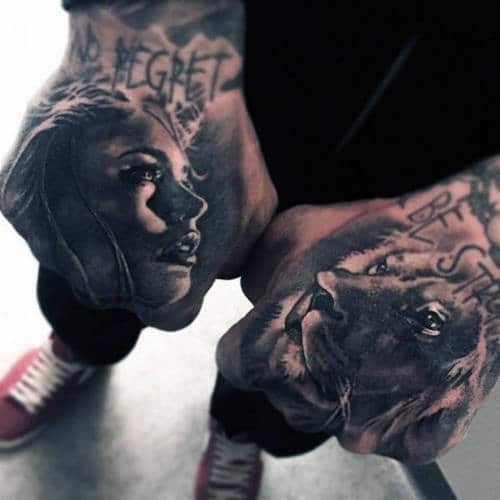 The tattoo’s dark red and black color with its shadow ash design goes well with each other consequently giving it a bold and ruthless appearance. 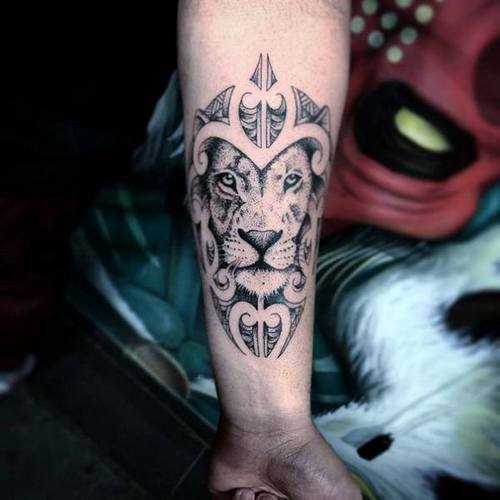 Tribal designs usually come with several sharp edges to project an intimidating and dominant feeling which in contrast to his lion tattoo, where its lines contain only two sharp edges arranged in a more low-key manner. In contrast to the tribal designs’ curvilinear patterns, geometric tattoos are more straightforward and linear. 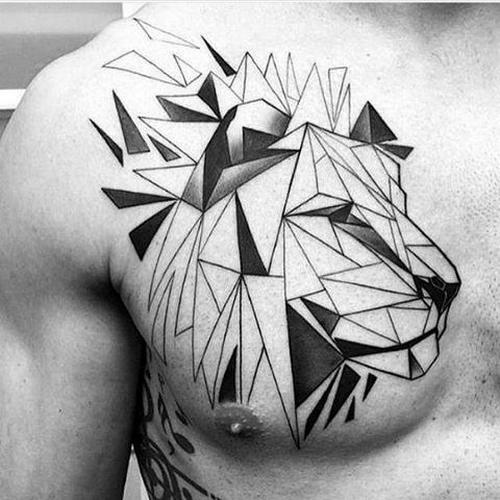 Geometric lion tattoos are becoming trendy nowadays because of their contemporary appearance. 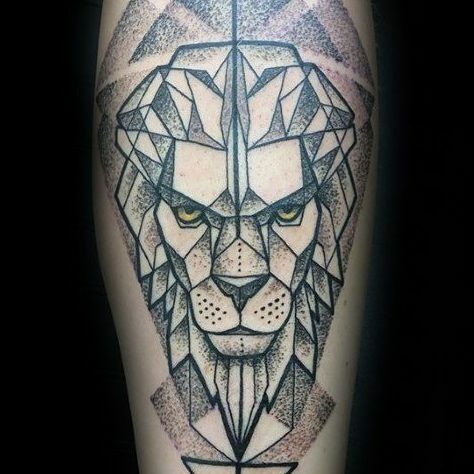 This lion tattoo combines geometric and pointillism concepts without compromising the lion’s dangerous character due to its serious yellow eyes. 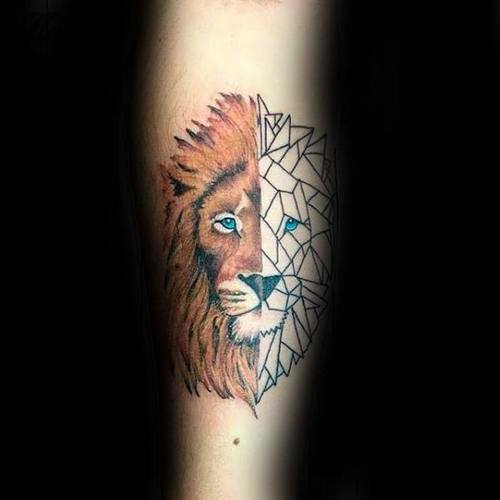 Combine a realistic depiction of a lion with an abstract geometric concept to give the tattoo more diversity. 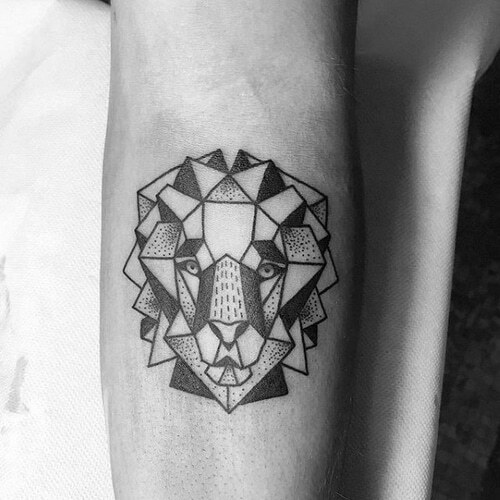 This geometric lion tattoo preserves its aggressive trait by using small and complicated geometric patterns. 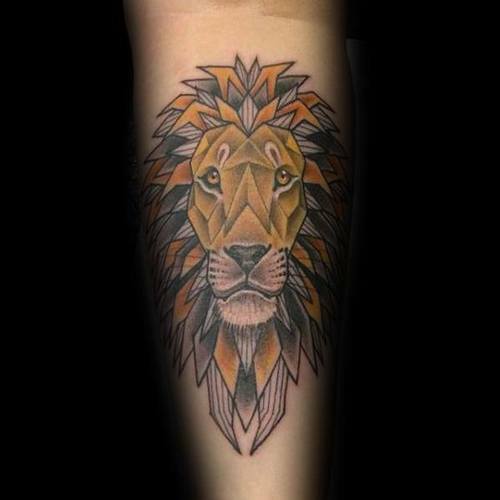 A standing lion symbolizes courage, strength, justice, and royalty. Its geometric shapes certainly add up to its dignified look. 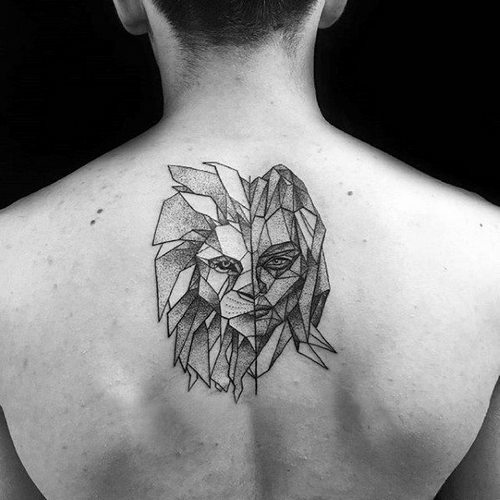 The usage of small multiple geometric shapes causes the tattoo to become more realistic-looking. 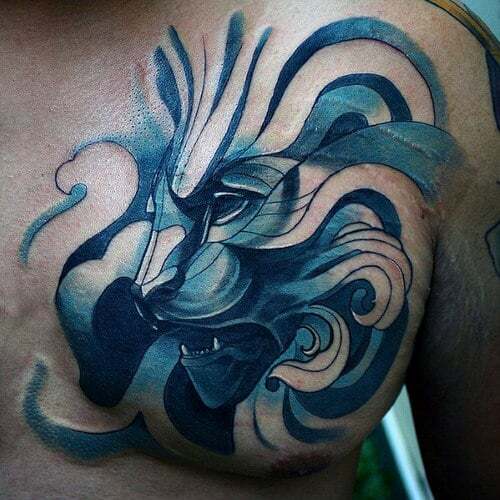 The abstract design of this lion tattoo conveys a profound meaning to itself. The lion’s disoriented state highlights its strength to overcome challenges in life. 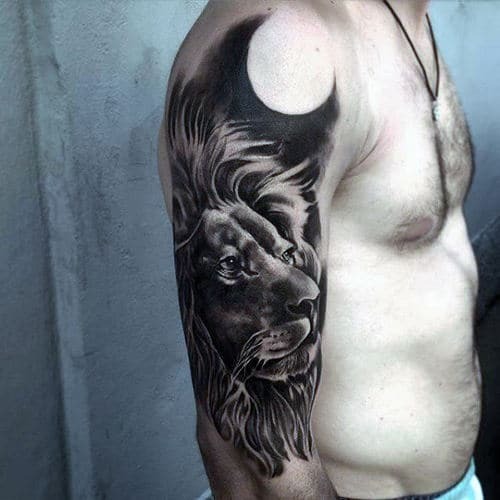 The tattoo’s lion and human head hybrid imply that the lion is the man’s reflection. 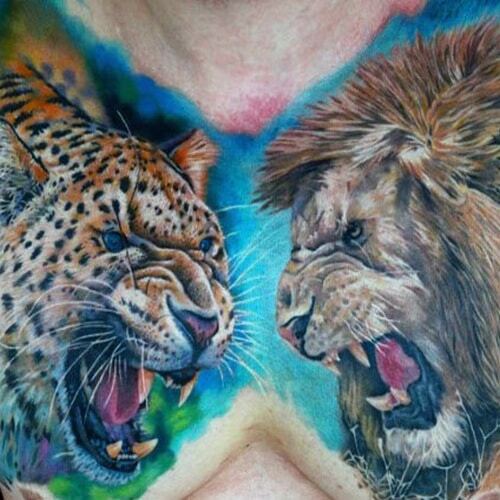 This tattoo suggests that there is a colorful side to what seems to be a tamed character. 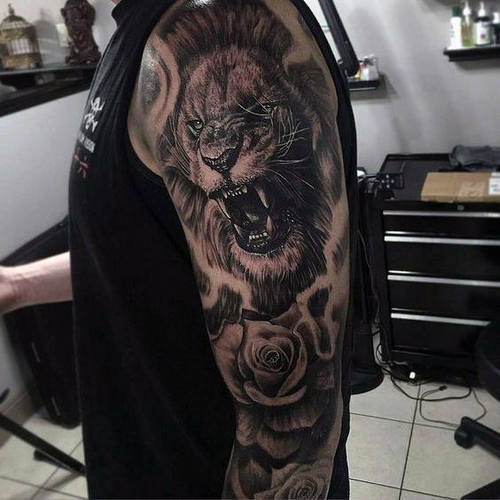 In Greco-roman mythology, lions symbolize love which is nicely established in this tattoo because of its red flower design expressing desire and passion. 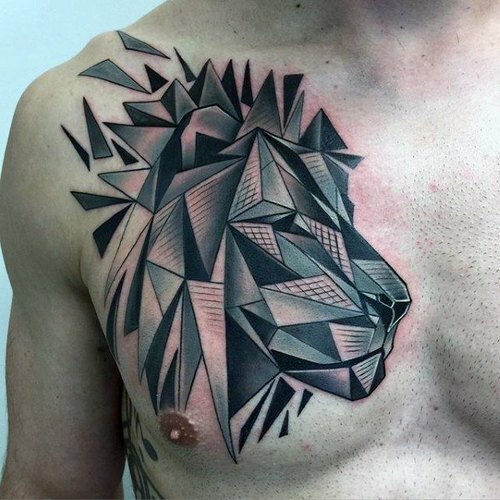 The lion tattoo’s pattern conveys the fragmented nature of the tattooee while its contemporary design makes it appealing to everyone. 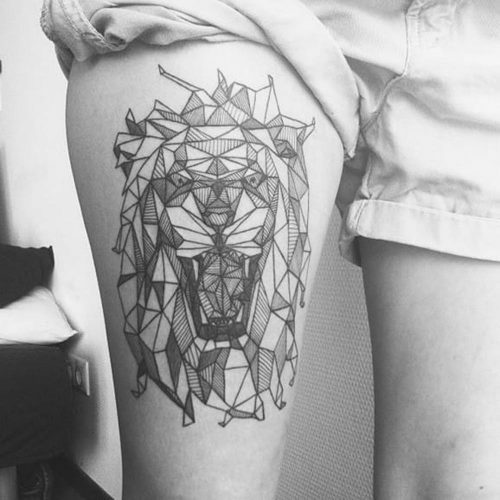 The composition of the tattoo’s geometric shapes gives off a young looking cub. 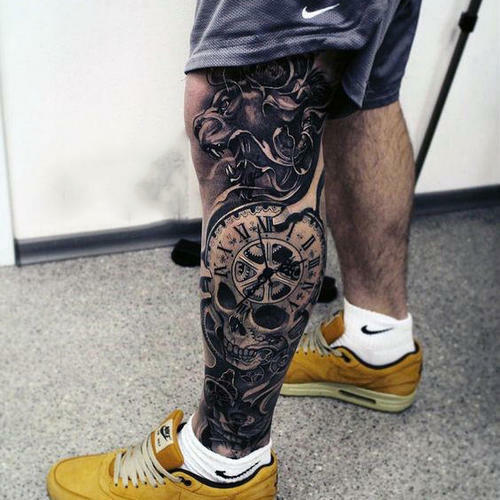 This tattoo means that the tattooee places importance on youthfulness. 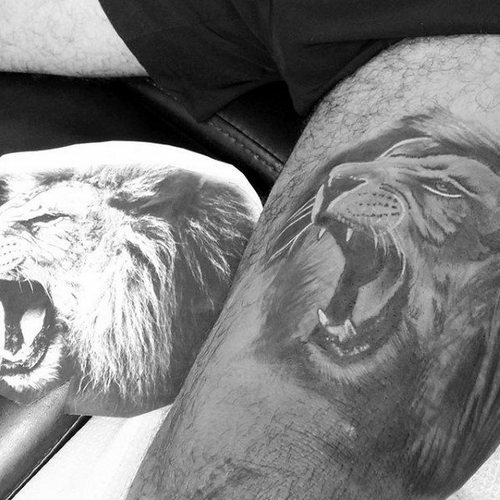 Lion Tattoo: Which Body Part Should You Have It? 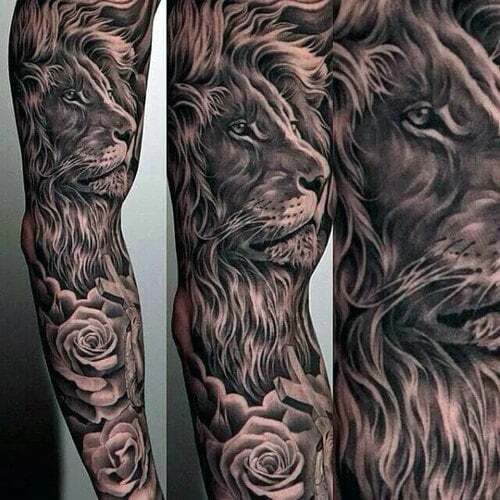 There are many places on the body you can choose to place your lion tattoo, but the famous ones are the following: sleeves, arm, chest, finger, hand, and thigh. These placements are chosen more often because of their high visibility. 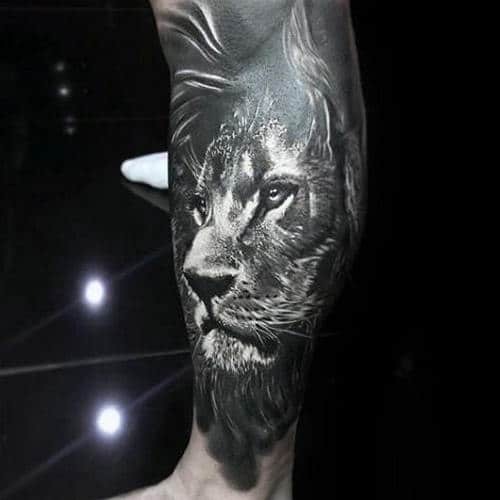 Since a lion tattoo provides you with a strong and fierce look, placing it on your arm, hand, fingers, on your ankle, makes it immediately noticeable while if you put it on your chest, thigh, or shoulder gives the tattoo limited exposure but creates a more powerful impact when others see it. 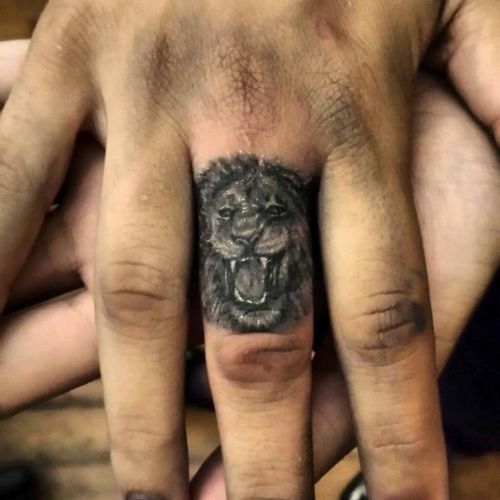 Take some time to decide whether you’d like to make your lion tattoo easily noticed or give it a slightly covert placement but with an impactful meaning. Placing your tattoo on your sleeve makes it easy for people to see. 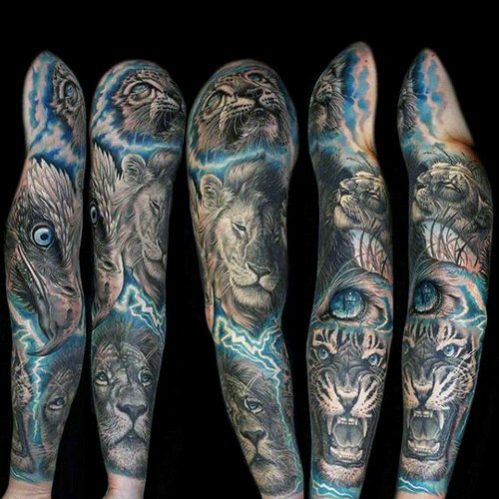 Because of the sleeve’s considerable area coverage, you can combine your lion tattoo with other designs such as with other animals and symbols to add more meaning to the whole tattoo. 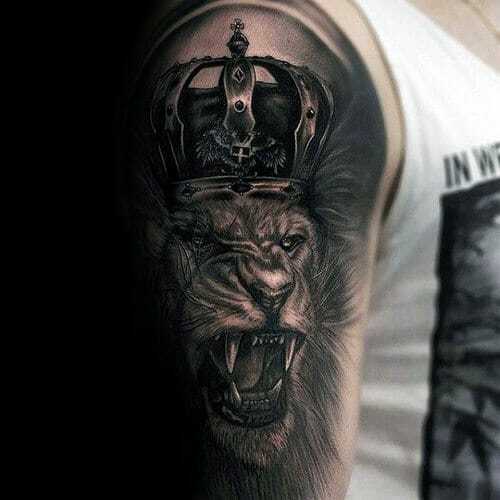 The lion in this tattoo wears a crown on his scarred face which indicates achieving greatness requires hard work, sacrifice, and blood and sweat. 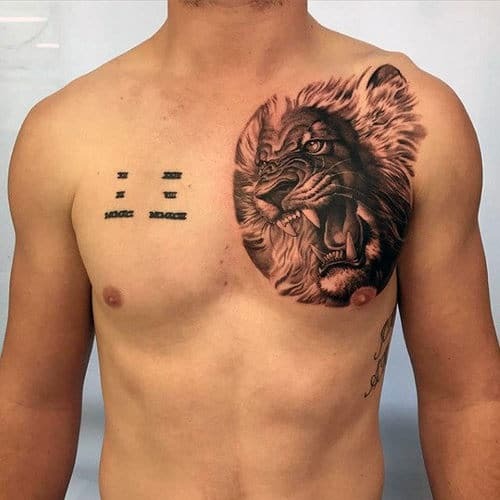 This particular tattoo got its inspiration from Greco-roman mythology since lions symbolize love and masculinity in their culture. 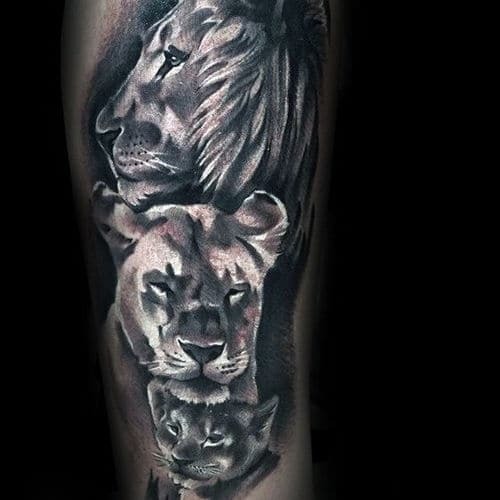 In this tattoo, the lion goes along with the other ferocious animals in the jungle such as the eagle, tiger, and leopard. This tattoo expresses passion and desire for love. The moon symbolizes wonder and balance. 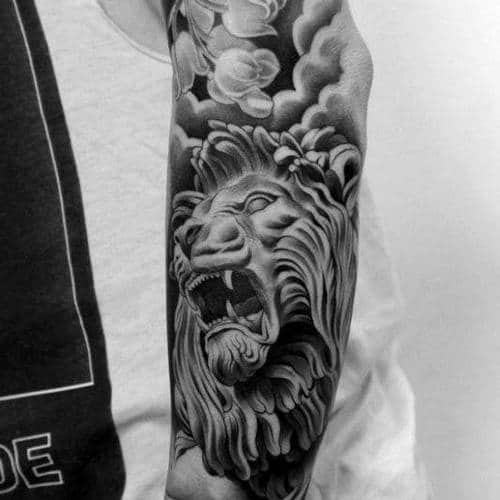 Consequently, this tattoo suggests that beneath the lion’s ferociousness, and fearlessness is a calm and composed individual. 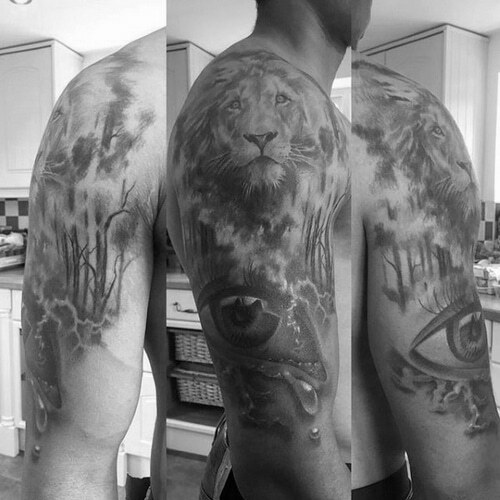 The lion is also a symbol of security which we can see in this tattoo where the lion is guided by the guardian angel. 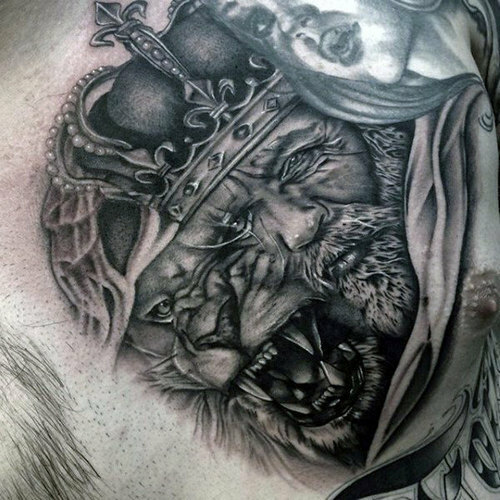 This is another tattoo symbolizing authority and protection of the lion together with the angel, warrior, and his chariot. 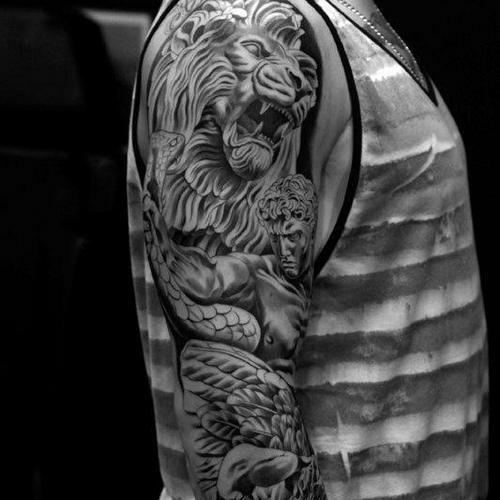 The lion’s scars represent the tattooee’s mental scars he acquired throughout his life. This tattoo expresses love, passion, and religious morals. 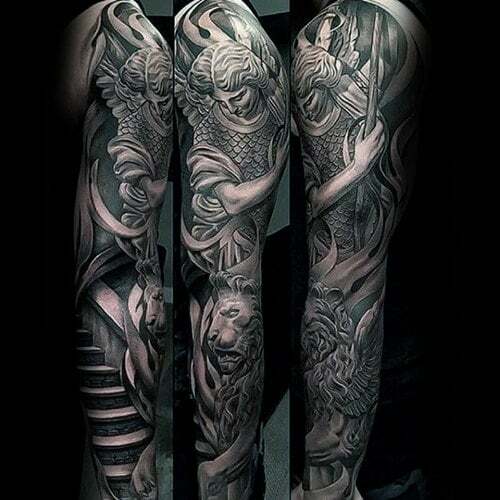 The sleeve placement of this tattoo will undoubtedly steal the attention of anyone near you. 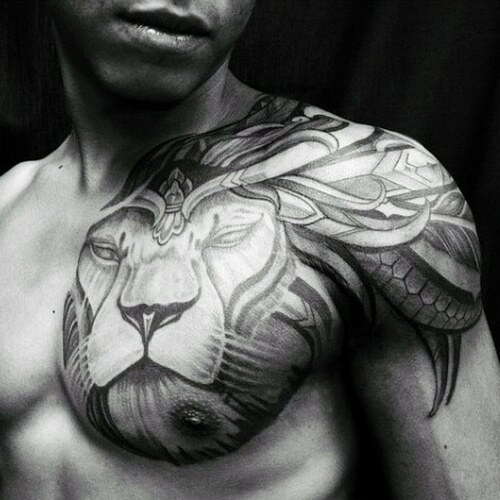 Statuelike lion tattoos represent unwavering strength and courage while its sky background represents heaven. 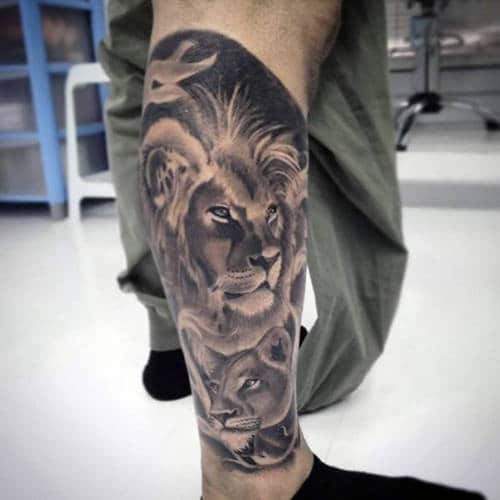 This tattoo contains a lion, a rhinoceros, an elephant, a cheetah, and a bull which are some of the hardest and strongest animals in the animal kingdom. 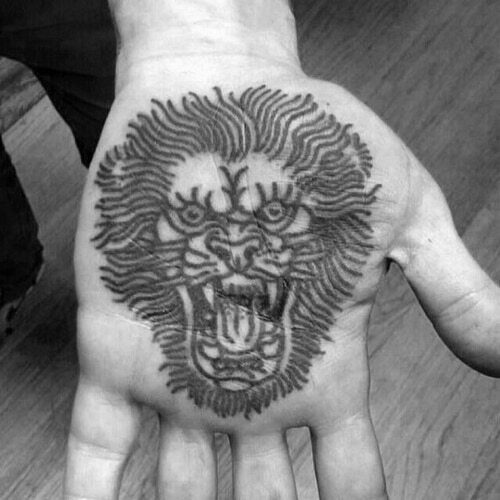 This tattoo contains a lion’s head and a crying human eye which implies that tough and driven individuals also have a soft side deep inside. 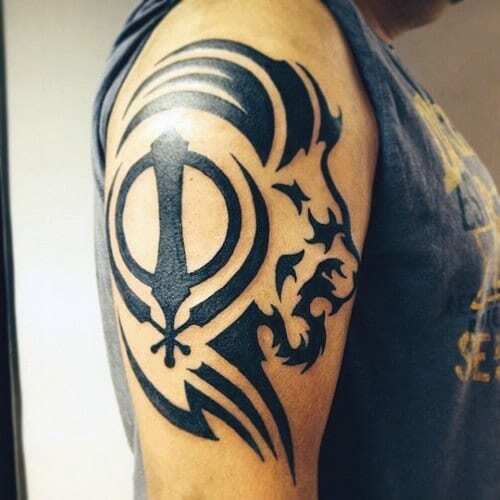 Forearm tattoos represent toughness and strength because of its prominent placement. 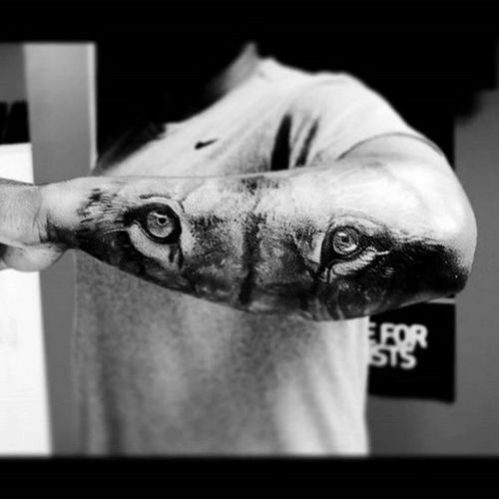 This tattoo reminds people that you have eye’s watching your back because of its unique placement on the end of the forearm. 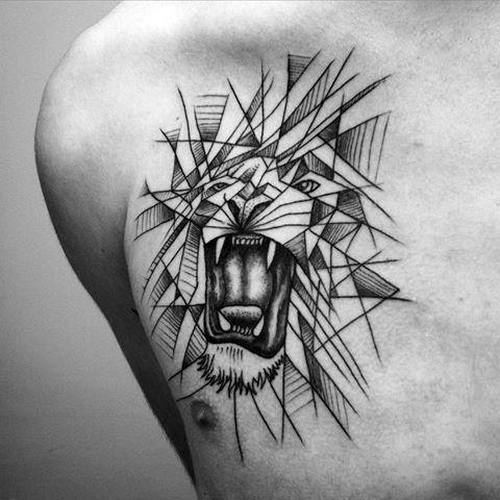 The unusually cold look of the lion in this tattoo embodies the calm yet dangerous personality of the man. 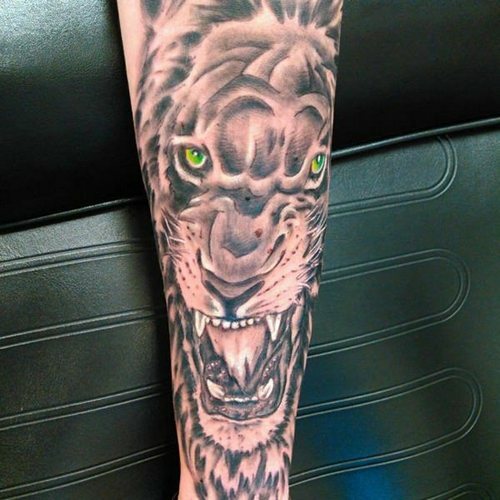 The lion’s yellow eye certainly is intimidating and scary while its placement on the forearm makes it very visible to anyone in front of you. 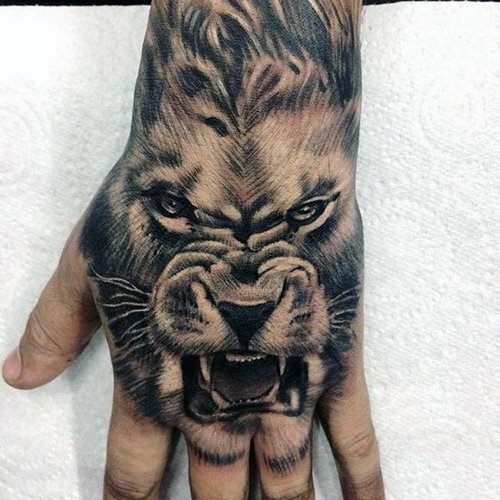 This beautiful tattoo is inspired by East Asian designs of the lion which gives it a more serious look because of its cold stare. 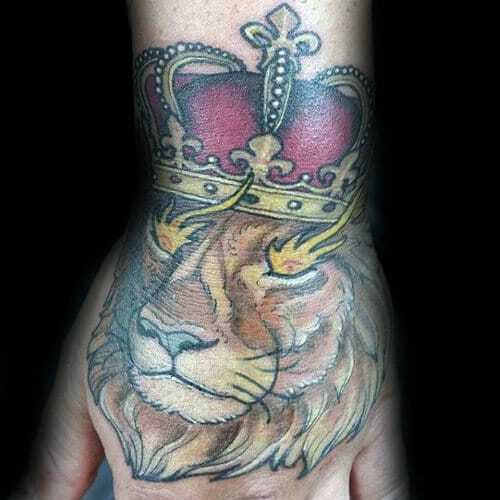 This lion tattoo has a contemporary looking crown and head armor giving it a more subdued look. 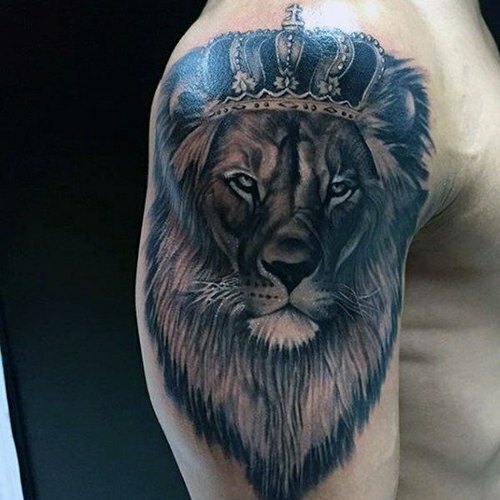 Unlike most lions with crown tattoos, this lion has no scars. A roaring lion overcoming the heights of a mountain intends everyone in its area to feel its presence. 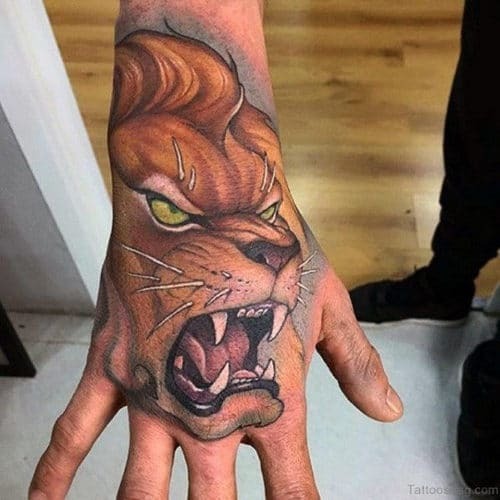 The cartoonish portrayal of this lion makes it look more two-dimensional without sacrificing its nasty look because of its angry stare. 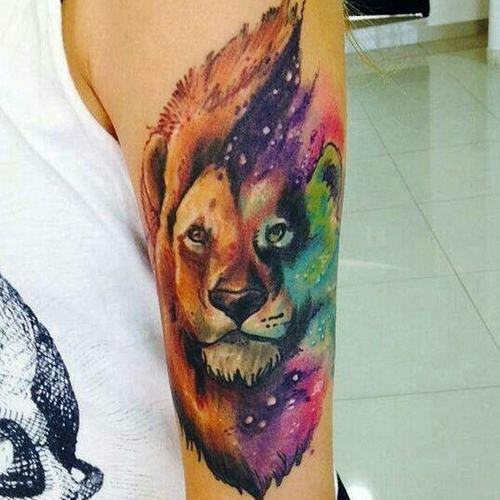 The colorful lion with the galaxy as its background signifies the tattooee’s grand ambitions. The lion’s anger is intensified by its wild green eyes and ravenous growl. 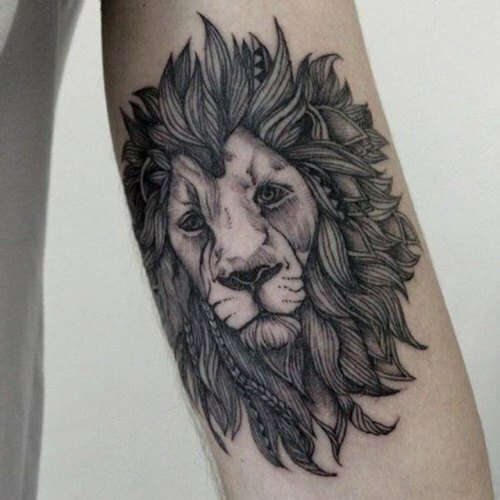 This tattoo represents a more mature and perceptive personality due to its calm and old-looking lion head. 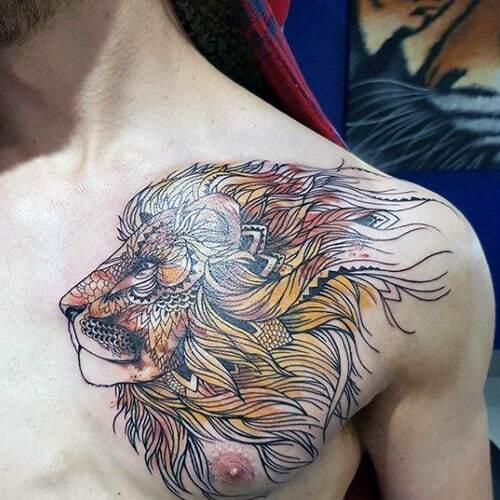 The colorful lion head’s placement on the top of the shoulder makes less visible when wearing a shirt but undoubtedly noticeable when wearing a sleeveless one. 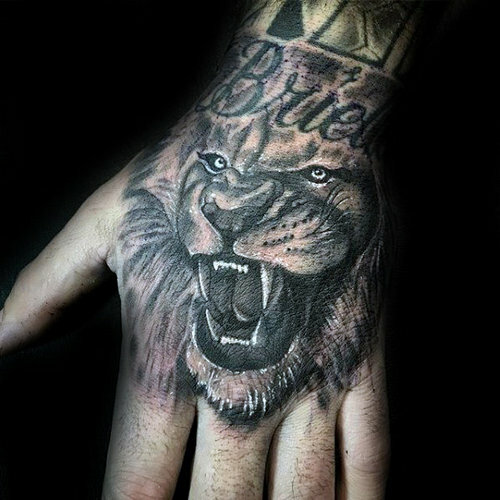 Hand tattoos are not familiar, and they symbolize boldness and courage, and inking in a lion design enhances its visual impact. 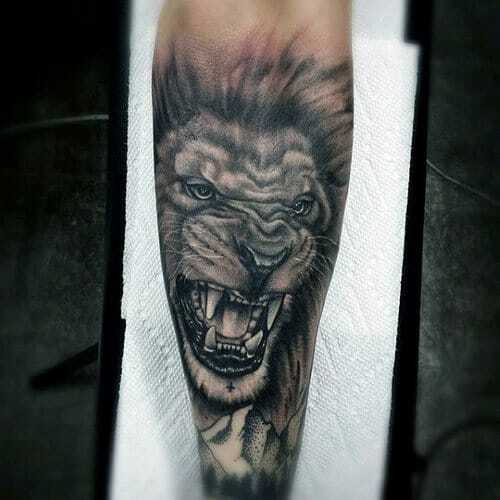 His roaring lion tattoo boosts the boldness of the tattooee. 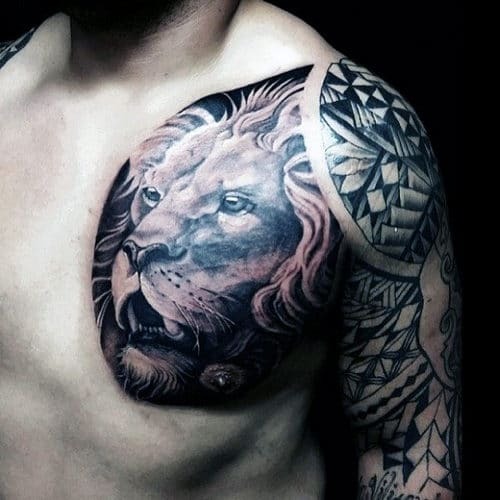 The brown color of the lion’s head complements the skin making the tattoo look more artistic. 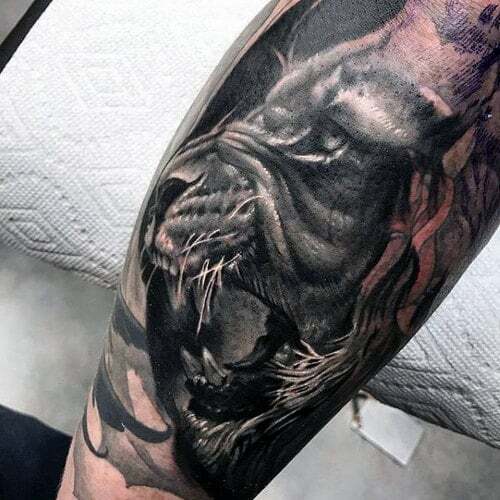 The angry roar of the lion in this tattoo is balanced out by the cartoonish design. 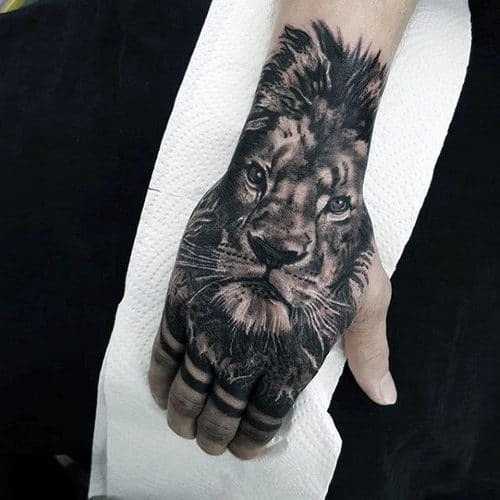 The lion’s serious look paired with its prominent placement certainly makes you look distinct. 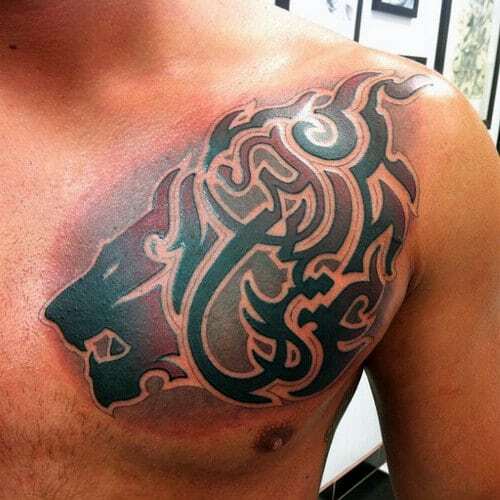 This tattoo is oozing with strength and passion because of its roaring lion and large rose design. 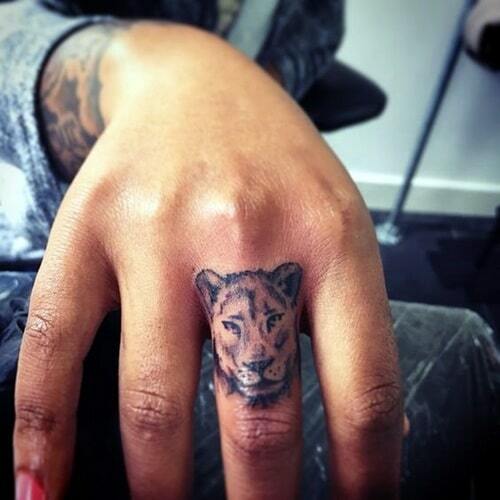 You can also put a complementing design in your other hand to give your lion design a partner. 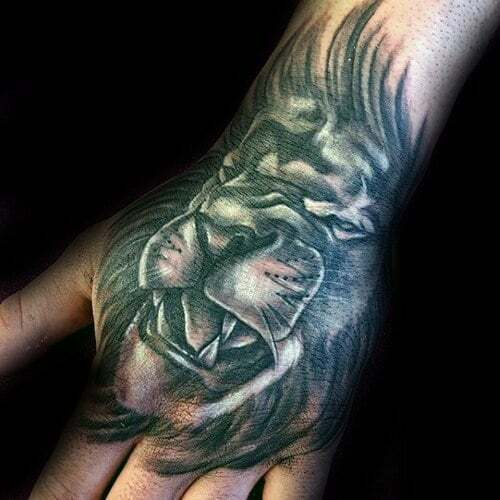 This lion’s old and gloomy look gives out a sharp yet strong impact. The lion’s king stature with its fiery eyes adds up to its tyrannical touch even more. 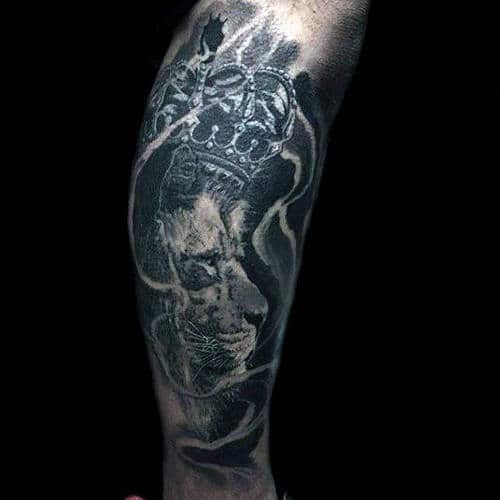 The troubles of the one who had this tattoo are embodied by this tattoo due to its distressed mood. 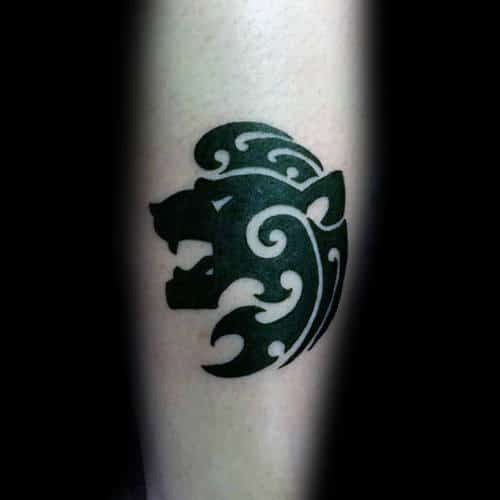 The tattoo’s minimal Chinese lion design sends chills to my spine whenever I look at it because of its icy stare and very sharp fangs. 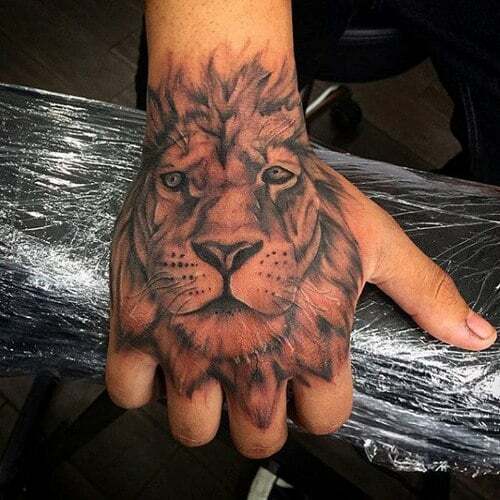 You can also put your name above your lion tattoo to give it a more obvious meaning. 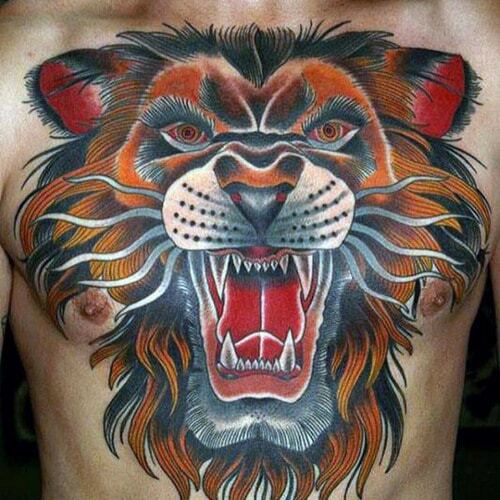 Chest Lion Tattoos are not visible when clothed, and are more meaningful because of their less obvious placing. 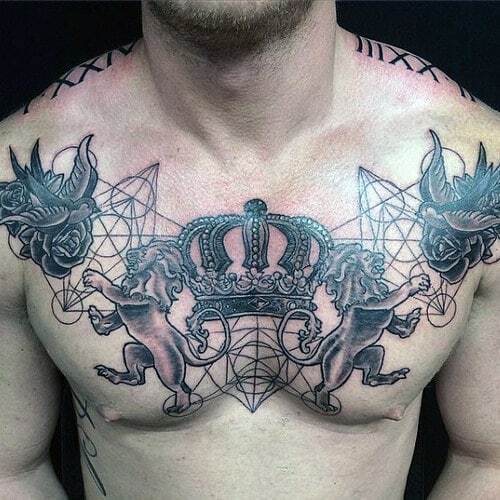 The standing lions with the crown in the middle make the tattoo look royal and noble. 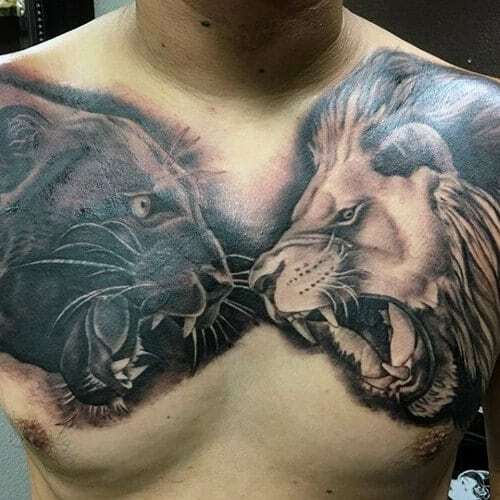 This tattoo which depicts the clashing of personalities has a powerful impact because of its portrayal of the facing off of two powerful, angry beasts. This is another Chinese guardian lion depiction which closely resembles a dragon. 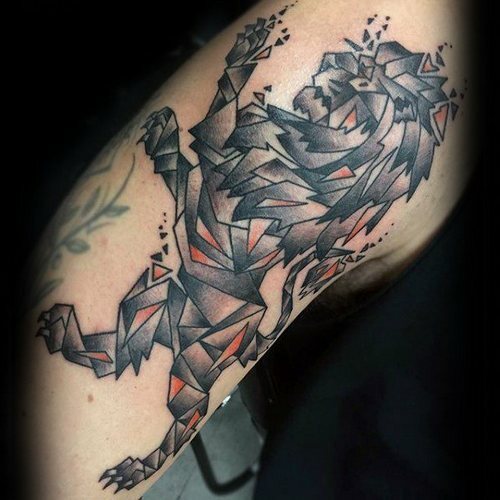 Give your lion tattoo a more classy look by employing an abstract design with a different color. 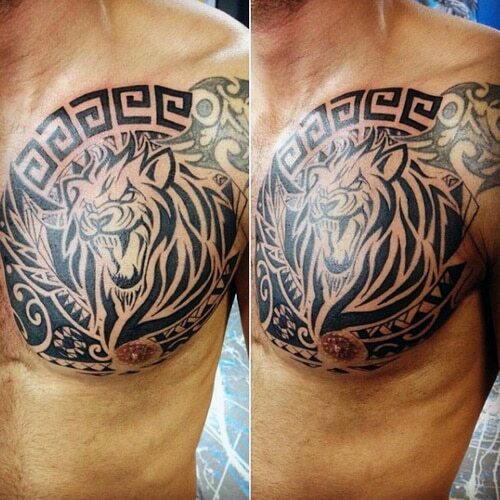 This chest tattoo is given more meaning because of the dates inscribed beside the roaring lion. 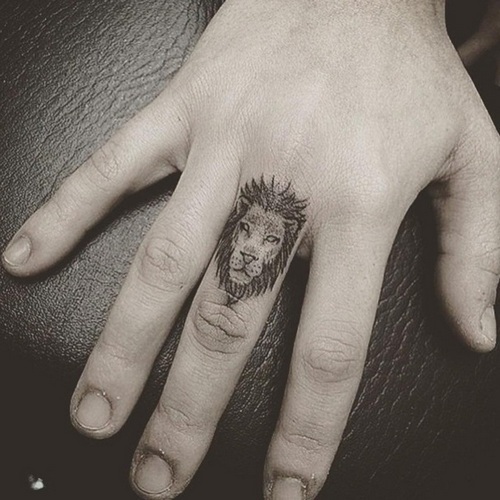 The lion with a compass tattoo outlines the person’s strong desire to find his life’s direction. 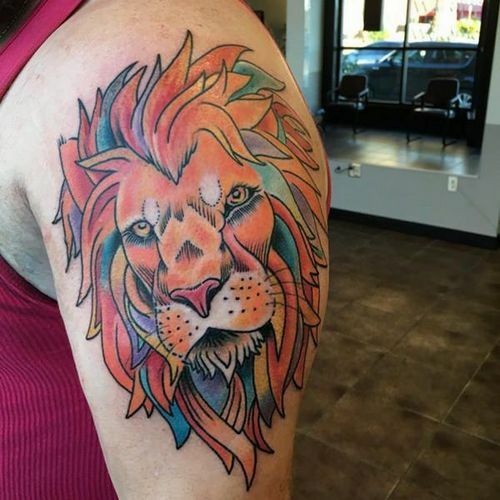 The lion’s colorful design is balanced out by its calm mood. 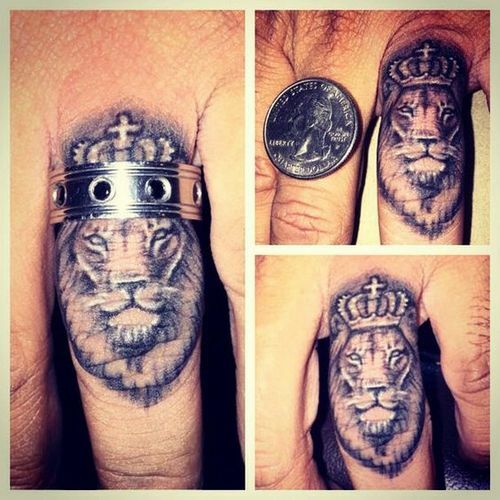 This tattoo implies that you are the king of your life and you are as fierce as a lion. 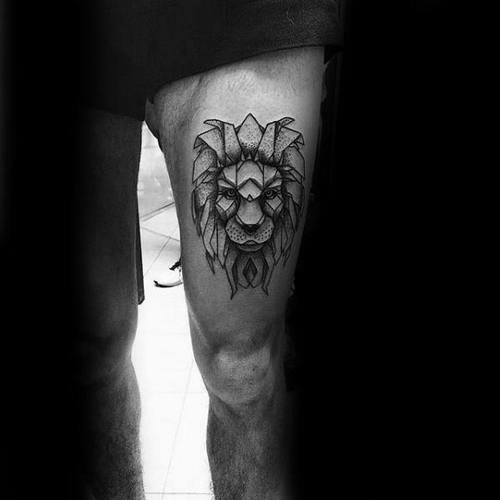 Placing a lion tattoo on the thigh is often a symbolism of the person’s sentiments because of its private placing. 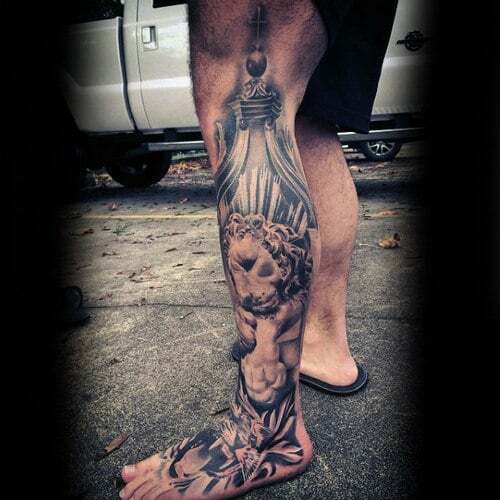 The tattooee’s love for his family is indeed represented in this thigh tattoo. 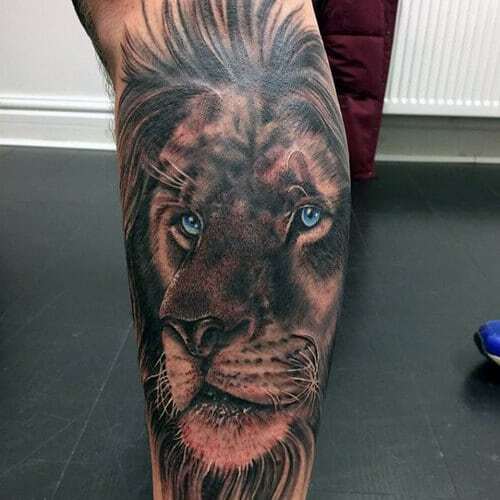 This lion tattoo is unique because of the lion’s different blue color. This tattoo represents the father’s ultimate love for his son. 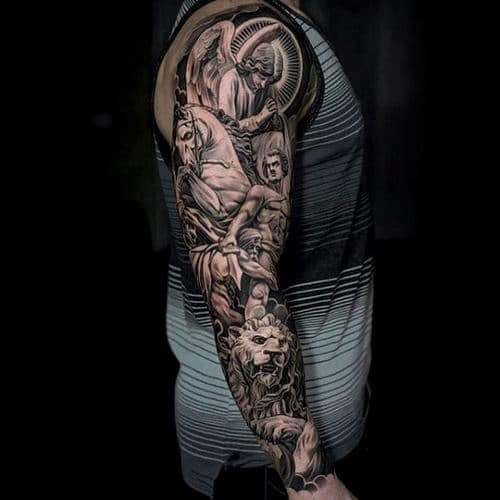 The statue lion under the church tattoo means that the tattooee has an unshakable faith in God. 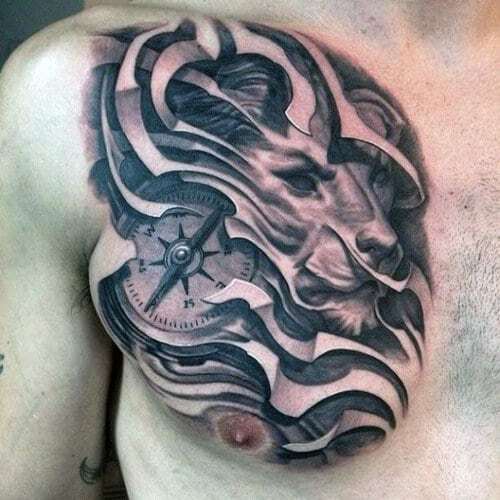 The tattoo’s lion, clock, and skull design suggest that the lion has to be strong despite being constrained by both time and death. 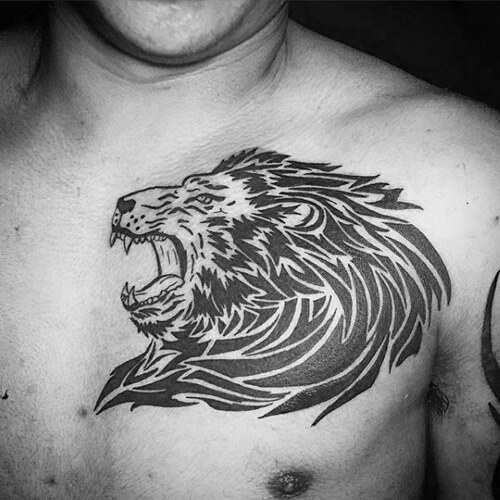 The running lion tattoo signifies being an unstoppable force due to its racing action. 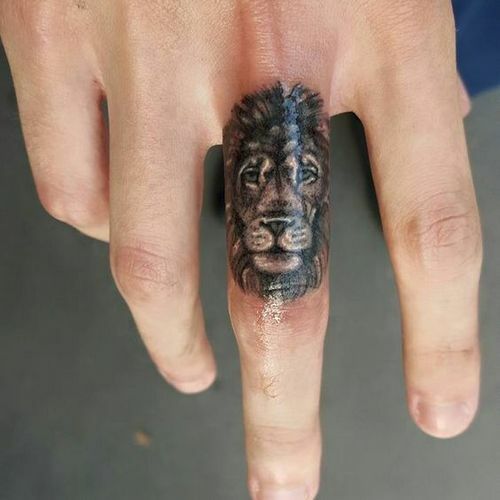 Finger lion tattoos are very rare because of their placement and is an excellent choice for people who want a small but noticeable tattoo. 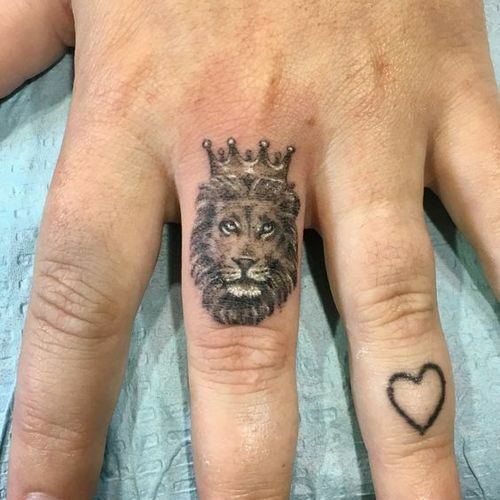 You can give this finger tattoo different looks since you can easily swap multiple rings to make it look like the lion’s crown. 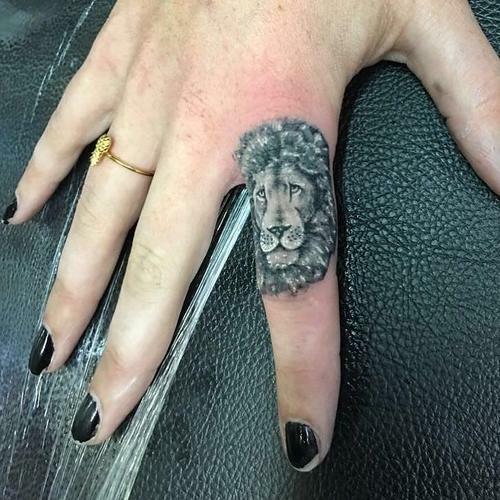 Lion finger tattoos are becoming more famous because of Cara Delevigne’s influence. 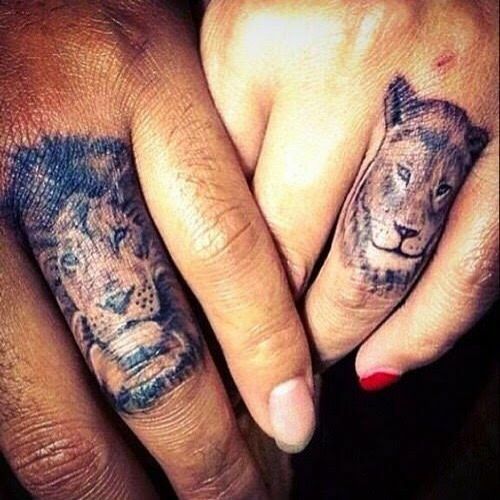 Getting a lion and lioness couple tattoo undoubtedly strengthens your relationship with your significant other. 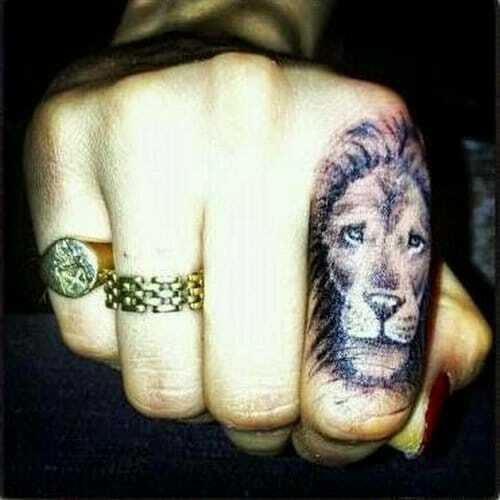 The snowy state and cold look of the lion certainly adds a more subdued and feminine look to its wearer. 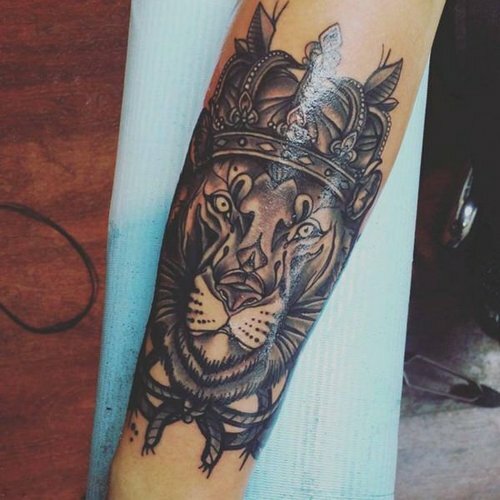 Getting a lion tattoo is undoubtedly an excellent choice for people who are new to tattoos. 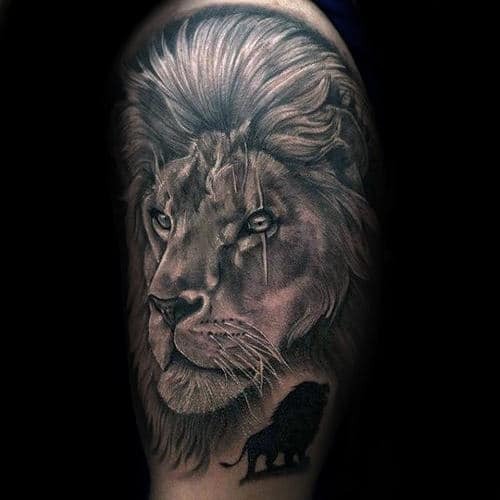 Lions symbolize bravery and strength which every one of us needs to conquer our fears in life. There is also a lot of places you can put your tattoo on depending on how noticeable you want your tattoo to be. 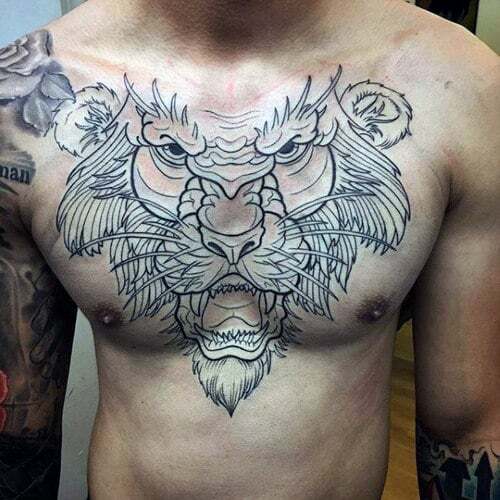 Take your time in deciding what kind of design you want and which part of your body you’d like to place your tattoo because it will eventually pay off. To gain more design inspiration, you can also look at different lions and see which kind of lion fits your design best. 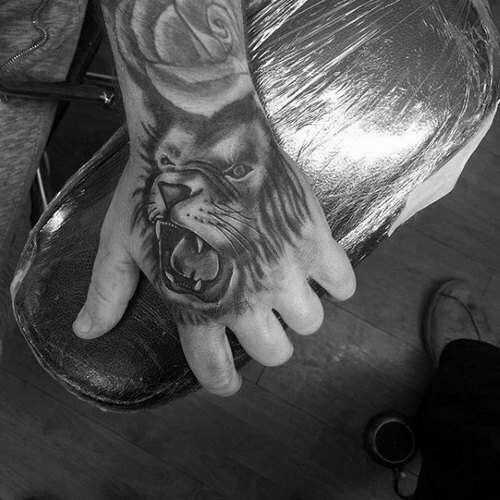 Also, always try to consult your tattoo artist every step of the way since they have more experience and knowledge. 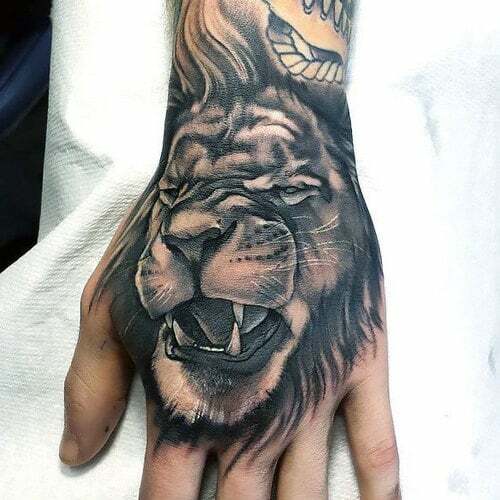 If you want other designs and inspirations for your next tattoo, you can check out our other articles!